Holistic Health and Muscle Testing | Purrrfectly Holistic...a Boutique for Cats! 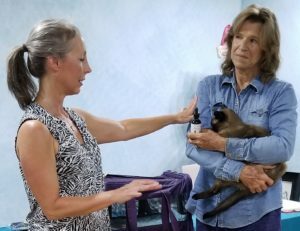 Purrrfectly Holistic…a Boutique for Cats! Within a holistic health paradigm it’s important to treat the whole person, not just symptoms in one aspect of health. The key is to get to the root cause of a condition, and at times it’s not just a physical issue but an emotional one as well. Muscle testing can help a practitioner work with clients on these different levels, which determines the most beneficial means of helping one to heal both physically, emotionally, and spiritually. Humans and animals are both energetic beings. In fact, everything on earth–including products, plants, structures, etc–is comprised of energy. One of the fundamental principles in understanding one’s energy is muscle testing. This is NOT an invasive procedure! It’s a way of evaluating imbalances in the body and assessing its needs. It provides information on energy blockages, how organs are functioning, nutritional deficiencies, and food sensitivities; it can be used to test the body’s responses to food (in the case of allergies), thoughts, emotions, sounds, and even colors. 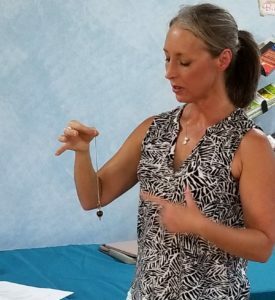 Several techniques include applying pressure on your arm, using your fingers, using a sway technique, and even using a pendulum. When I first took a class on muscle testing I was amazed to find how easy and simple this method is. Testing results in either a positive and negative response. Within this framework you can test or ask anything. Why do I think this is so cool? It’s simple: you find out immediately if a product will work for you–if your body needs it–and you don’t waste time and money on products that won’t work. How many times have you thought about the type of medicine or protein powder or supplements you choose? How do you know when something is actually working? Is it the very best option for you? By muscle testing you will know precisely! Have you ever tried to fight off an illness that just won’t seem to go away? You try product after product (or in some cases Z pack after antibiotic) without really getting back to 100%. Chances are, you are not taking product(s) that work with your body. Are you the type of person that takes countless supplements just because you’ve heard they are good for you? You know the list: Vitamin C, D3, E, B complex, multi-vitamins, calcium, magnesium, milk thistle, probiotics, fish oil… You may be throwing your money down the drain unless you know for sure your body is deficient and can actually benefit from using it. Plus, not all products are made the same, and not all brands are equal. Sometimes you need to test several different brands to find out which one your body agrees with. There are several different modalities of muscle testing. To use it with cats I become the surrogate and test the cat’s energy through me by touching or holding the cat. The sway test is a great method of testing because you can hold the cat while you ask questions. The direction of the sway (positive or negative) will determine the answer. I can also use a pendulum and set the product in question next to the cat and ask the questions. The pendulum will swing one way for yes and another way for no. If the cat is not present I think about the cat or use a photo while asking questions. I also muscle test when I take the cats to the vet, and thankfully my vet is a little familiar with it and doesn’t look at me like I’m strange. I test the vet’s suggested treatment options and medicine in order to find the very best solution for them. (There’s nothing more frustrating than having a huge vet bill at the end of the appointment and then have to make a second visit when the condition doesn’t clear up.) I also use it to determine if specific foods, supplements or natural medicine is needed for any given conditions my cats may have. I’m also able to determine protocols for amounts and frequency of any product I need to give my cats. Check out a couple of examples here and here. If your cat has a health issue or perhaps you want to find out if the food or supplements you’re using are beneficial, let’s muscle test and find out! The technique works both in person and remotely with a photo of your cat. How is this possible? Energy is energy and cannot be contained. Therefore, the same energy will resonate whether you are in person or not. When you purchase an analysis with me you’ll provide me via email a photo of your cat along with photos or a complete, detailed list (including brand names) of all the food, supplements, medicines, flea and pest control, grooming products, and anything else pertaining to your cat’s lifestyle or health you would like analyzed. Please allow up to 3 days for me to complete the analysis. A 20 minute consultation to discuss your cat’s health issue, diet, health history, recent vet exams, tests, blood work, etc. Want to see an example of an analysis? Check out Tanisha’s Story and Liz Taylor’s Troubles. If you’d like to speak with Pam to ask questions or discuss concerns about your cat before purchasing you can sign up for a FREE 20 minute consultation here! Disclaimer: We are not vets! Our services are not intended to replace regular veterinary care but can be useful as a complimentary tool. Results and findings are not intended to diagnose, treat, or cure. 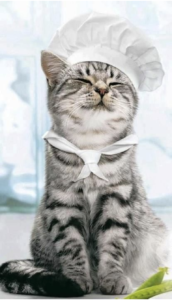 If purchasing any services you agree and understand that service providers are not licensed veterinarians or doctors and are only facilitating wellness using energy techniques including muscle testing and energy testing to identify and address stressors and recommend holistic health modalities that are found to be in your cat’s highest and best good.